Many wrestling fans may not know that for a very brief period of time (1986-87) Andre the Giant wrestled in the WWE under a mask as the Giant Machine! As the story goes, the mask Andre wore was inspired by Japanese wrestler Junji Hirata (aka Super Strong Machine). The gimmick was given to Andre as part of a storyline to help him take time off from wrestling while filming The Princess Bride. 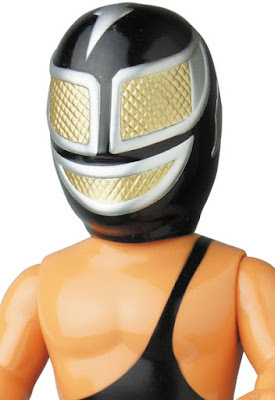 This unique, albeit brief, stage of his career has now been immortalized as a killer vinyl figure as part of Medicom Toy’s ongoing WWE Sofubi Fighting Series! The WWE Giant Machine Sofubi Vinyl Figure by Medicom Toy stands 10” tall, features 3 points of articulation and wears a mask that can be removed to unveil Andre the Giant underneath! You may notice the figure’s body features the Giant Machine wearing a one strap singlet to match Andre’s gear late in his career.